Absolutely Live Entertainment's Danny Melnick and Tracy Reid have extensive histories of producing and presenting music festivals. Currently ALE partners with Saratoga Performing Arts Center to produce the Freihofer's Saratoga Jazz Festival in Saratoga Springs, NY which celebrates its 42nd edition on June 29 & 30, 2019. The festival presents the best names in jazz, R&B, Latin and world music. As veteran employees of George Wein's company, Festival Productions, Inc. in New York, Melnick & Reid helped to produce and present JVC Jazz Festivals in New York and Newport, the Newport Folk Festival, the Bermuda Music Festival, and the Verizon Music Festivals, among others. Melnick produced the Mellon Jazz Festivals in Philadelphia and Pittsburgh, the Boston Globe Jazz Festival and served as Artistic Director of the Newport Jazz 50th Anniversary Festival in 2004, and as Producer in 2016 & 2017. They bring further experience to the table having worked on many of the largest festivals in the country (New Orleans Jazz & Heritage Festival, Essence Music Festival, Sundance Film Festival, DelFest, et al) and with countless partners, municipalities and sponsors. All told, our team has helped to create and produce over 105 festivals in Europe, Japan and the US. Absolutely Live Entertainment produces originally conceived concert tours and manages them for artists, agencies and sponsors. We produce profitable tours from "soup to nuts", professionally handling all aspects of the project including sponsorship management, finance, travel, media relations, promotion, merchandising and box office operations. Our next Monterey Jazz Festival on Tour will celebrate the venerable event's 60th anniversary year. It will take place during March and April 2019 and feature Cecile McLorin Salvant, Bria Skonberg, Melissa Aldana, Christian Sands, Yasushi Nakamura & Jamison Ross. We will be producing concerts in 2019, and a world-tour in 2020, of the all-female jazz ensemble Artemis, featuring Renee Rosnes, Anat Cohen, Melissa Aldana, Ingrid Jensen, Noriko Ueda and Allison Miller. And, in 2020, we are producing Fly HIgher, a global tour celebrating the centennial of Charlie Parker, featuring Rudresh Mahanthappa and Terri Lyne Carrington as co-music directors along with Charenee Wade, Kris Davis, Adam O'Farrill, Larry Grenadier & Kassa Overall. From 2010-13, ALE produced concerts throughout North America in association with HBO's acclaimed show, "Treme." -- a night in Treme, the Musical Majesty of New Orleans, featured Donald Harrison, Jr., Soul Rebels Brass Band, Preservation Hall Jazz Band, Rebirth Brass Band, Cyril Neville, Leo Nocentelli, Stanton Moore, Glen David Andrews, Ivan Neville, James "12" Andrews, Dr. Michael White, Big Sam Williams, and a host of other fabulous New Orleans musicians. In 2013 ALE produced the Montery Jazz Festival's 55th Anniversary Tour featuring Dee Dee Bridgewater, Christian McBride, Chris Potter, Ambrose Akinmusire, Benny Green and Lewis Nash. In 2014, ALE produced the "Newport Jazz Festival: Now 60" tour featuring Anat Cohen, Karrin Allyson, Randy Brecker, Mark Whitfield, Peter Marin, Larry Grenadier & Clarence Penn. In 2016, ALE produced the Monterey Jazz Festival on Tour 2016, featured Raul Midon, Ravi Coltrane, Nicholas Payton and the Gerald Clayton Trio with Joe Sanders and either Gregory Hutchinson or Kendrick Scott. Other ALE tours of note include Danilo Perez's Things to Come: 21st Century Dizzy 2010 tour, which dazzled audiences with its all star lineup, and pan-global collaborations; The Blue Note 7 tour of 2009, featuring Peter Bernstein, Ravi Coltrane, Lewis Nash, Nicholas Payton, Peter Washington and Steve Wilson, and musically directed by Bill Charlap, paid tribute to Blue Note Records' 70th anniversary, with a North American tour spanning four months, and a critically lauded CD recording, The Blue Note 7: Mosaic. Jimmy Cobb & The So What Band's Kind of Blue @ 50 tour took the band around the globe, paying tribute to one of the greatest jazz recordings of all time, Miles Davis' Kind of Blue. Danny and Tracy have worked in the music business for over 50 years, collectively, and have never managed an artist, until now. Consistently heralded by critics as one of the most original composers in his field, alto saxophonist RUDRESH MAHANTHAPPA’s prolific contributions to contemporary jazz have earned him a Guggenheim Fellowship, commissions to create new work from the likes of the Rockefeller Foundation MAP Fund, Chamber Music America and the American Composers Forum, and top alto saxophone player honors by Downbeat International Critics Polls six of the past seven years - 2011-2013, and again 2015-2017. His rare ability to synthesize South Indian music concepts with a seemingly boundless range of unexpected influences frequently characterizes him as one of the most important artists in music today -- a distinction the Jazz Journalists Association recently echoed by naming him Alto Saxophonist of the Year FIVE consecutive times from 2009-2013 and again in 2016. Rudresh was one of 20 recipients of the 2013 Doris Duke Performing Artist Award, one of the largest and most important arts awards in the world. In 2015, he was named a United States Artists Fellow. In June 2016, he was named Princeton University’s Department of Music Director of Jazz and as the Anthony H. P. Lee ’79 Senior Lecturer in Jazz Studies. But accolades aside, it’s what the New Yorker has called Rudresh’s “visceral tone and grab-you-by-the-collar attack” that’s driven new, international audiences to his performances. NPR, the Los Angeles Times, the Village Voice, the Boston Globe, JazzTimes and other publications have hailed the rhythmic dynamism and exuberant ensemble interaction sparked by his groups. Though the formats vary widely, Rudresh’s purpose shines through them all. His latest recording, Agrima, by the reunited Indo-Pak Coalition featuring Rez Abbasi & Dan Weiss, was released on Octobert 17, 2017. Rudresh will tour throughout 2018 & 2019 with the Indo-Pak Coalition and a new project called Movable Mirror, featuring drummer Dave King and bassist Eric Revis. Absolutely Live Entertainment can produce any type of event, from corporate to private, from theaters to outdoor concerts or small gatherings. We have expertise with event budgeting, staffing, infrastructure, ticketing, site design, staging, scheduling, logistics, and more. And we are available as consultants in person, on the phone or over skype/facetime, etc. on an hourly-basis. 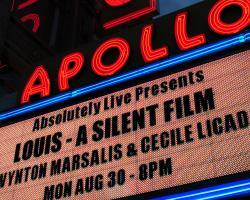 Two unique events ALE managed were Louis, A Silent Film at the Apollo Theatre, which featured the Wynton Marsalis Ensemble and pianist Cecile Licad performing live to Dan Pritzker's homage to Louis Armstrong; and James Frey's New York City Bright, Shiny Morning book release blow-out party at the Gramercy Theatre. The Brubeck family greatly honored us by selecting us to produce Dave Brubeck's memorial celebration on Saturday, May 11, 2013 at the Cathedral of St. John the Divine and the Brecker family has done the same with Michael Brecker's memorial at The Town Hall, and two celebrations of his life and music at Jazz at Lincoln Center which featured Paul Simon, James Taylor, Bobby McFerrin and Dianne Reeves, Diana Krall, Chaka Khan, Ravi Coltrane, Randy Brecker, Wynton Marsalis and many others. ALE was proud to work with JusticeAid, on May 15, 2016 at Washington’s Historic Lincoln Theatre where we presented Grammy Award-winning Ozomatli and DC’s local go-go legends Trouble Funk. The sold out concert benefited the National Juvenile Defender Center and the Campaign for the Fair Sentencing of Youth. On May 24, 2017, at the City Winery, ALE produced another sold-out event for JusticeAid entitled "Gotta Serve Somebody," an all-female celebration of Bob Dylan with Ruby Amanfu, Martha Redbone, Carrie Rodriguez, Somi, Kandace Springs, and Dar Williams. This unique concert benefited the Mental Health Project of the Urban Justice Center in NYC. And on April 24, 2018, ALE produce yet another sold-out event for JusticeAid entiled "Songs for Lady Day: The Music of Billie Holiday," featuring Marshall Crenshaw, Cecile McLorin Salvant, Paula Cole, Kandace Springs and Dom Flemons at The Hamilton in Wasington DC. This event raised over $100,000 for the Civil Rights Corps and Essie Justice Group in their fight against racism and economic inequality in our justice system. 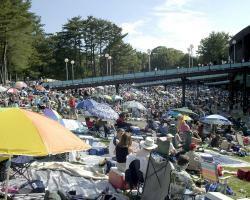 Absolutely Live Entertainment has presented numerous concerts since it's founding in 2007. We have strong and extensive venue relationships and have proven to be a dedicated promoter for many artists in New York City and in Boston. Recent presentations include Jon Anderson (The Voice of YES) at the Somerville Theatre, A Celebration of Kate McGarrigle at New York's Town Hall, the Iranian folk singer, Sima Bina, the worldwide exclusive reunion of Pee Wee Ellis, Fred Wesley and Maceo Parker, Jean Pierre Magnet y Serenata de los Andes, and the Wainwright/McGarrigle Family Christmas Concert. ALE served as consulting producer of Chicago Orchestra Hall's United Sounds of America series - six unique concerts celebrating the musical heritage of different American cities, which took place in June, 2011. 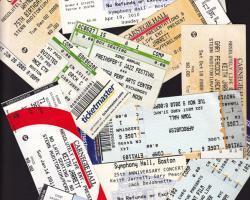 Additionally, Danny Melnick has curated "The Shape of Jazz" series at Carnegie Hall's Zankel Hall since 2003. Since our inception, Absolutely Live Entertainment is proud to have presented Kodo Drummers of Japan, Wayne Shorter Quartet, Keith Jarrett (solo & trio), AfroCubism, Sonny Rollins, Gary Burton Quartet with Pat Metheny, Iranian Sounds of Peace: Rumi Symphony Project, the Canadian Brass, Afro-Cuban All Stars, among many others.